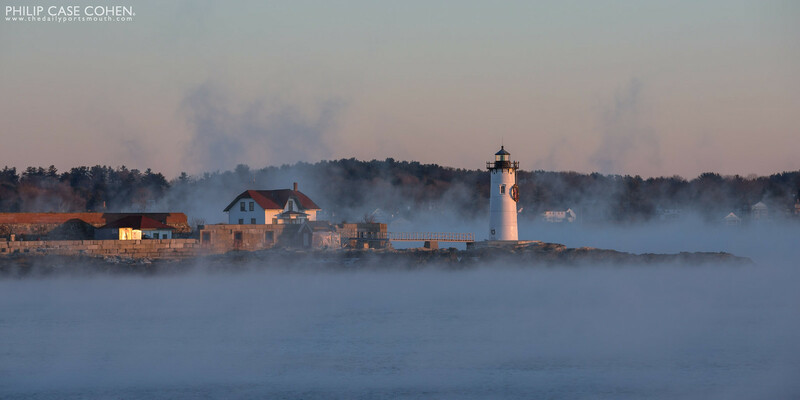 Another frigid morning in coastal New Hampshire filled with fresh light and the promise of a new day. I couldn’t settle on where I wanted to venture out to for a cold sunrise on a Saturday morning, and decided that if the conditions were great at Great Island Common that I would be kicking myself when I got home and didn’t shoot there. When I arrived it was a beautiful but underwhelming scene at first (in comparison to last week’s incredible show) – but once the sun rose over the horizon, everything changed for me. It was a little too cold for my hands to be quick in shooting with 2 sets of gloves, but I had a great morning and enjoyed watching this scene unfold once again! 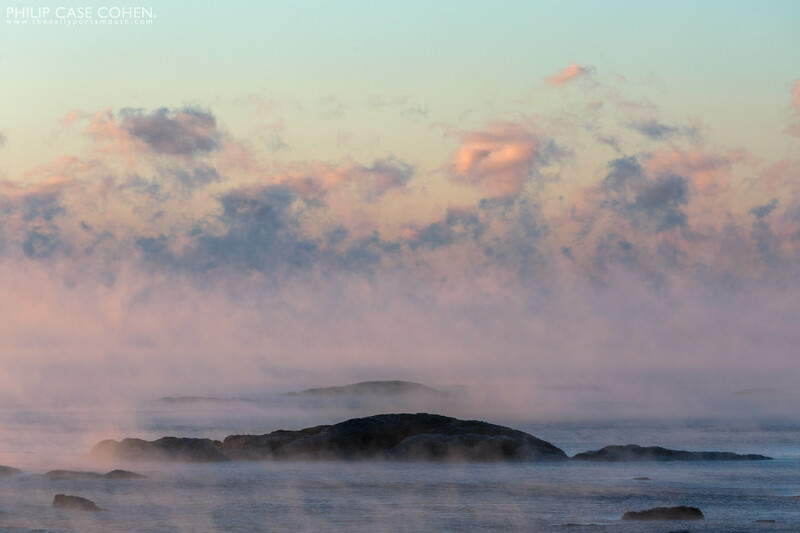 This is Part II of the sea smoke filled morning at sunrise in Great Island Common. 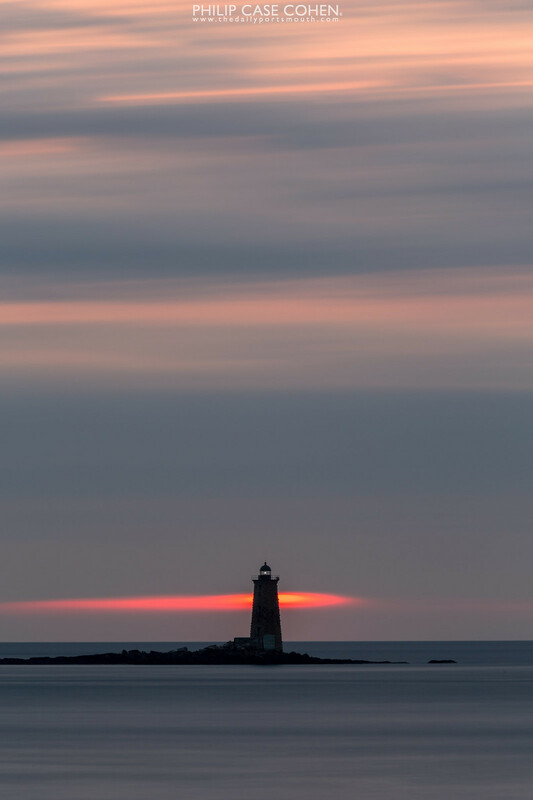 The previous post featured a Portsmouth Harbor Lighthouse at dusk without the early morning’s sunlight in the scene – with everything changing ever so slightly with the glow of the sun. The dramatic cold weather and bright sunlight that blasted the scene on the morning of January 8th also brought brilliant scenes in all directions. 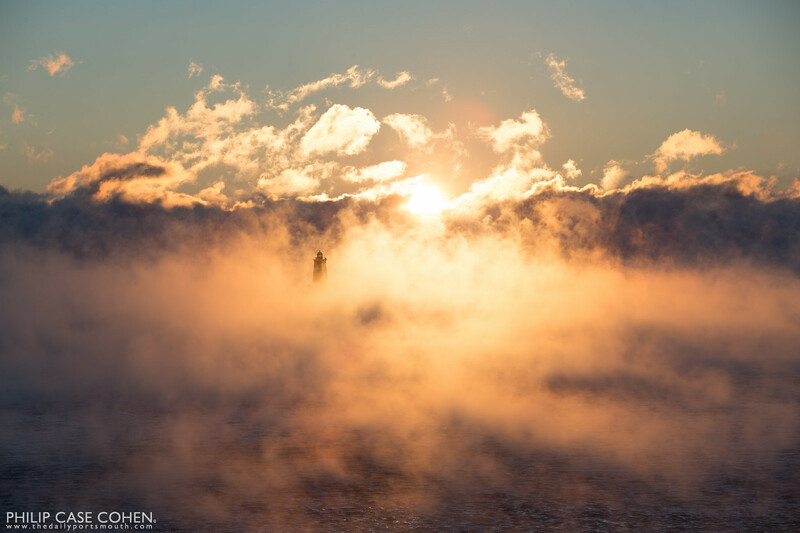 This view towards the southeast highlights a rock formation and the colorful sea smoke that enveloped the coastline. 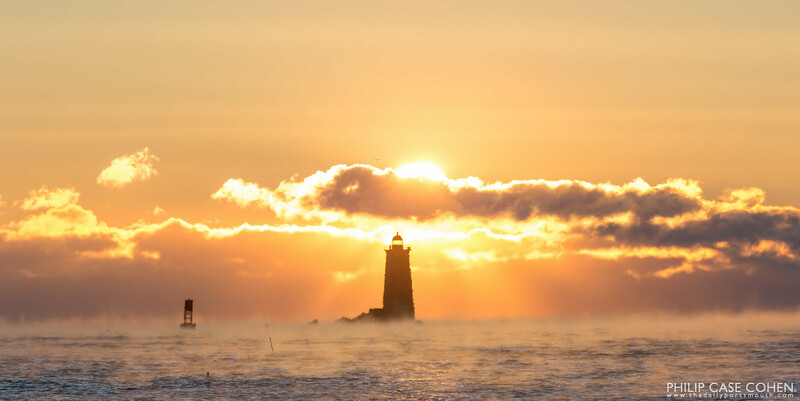 After the sun crested over the cloud bank on the horizon, the entire coastline and the sea smoke hovering above the water were illuminated with a fiery orange glow. This was one of the more amazing scenes I’ve ever witnessed and I can’t wait for the next opportunity to venture out on a frigid morning. On a recent trip out to Great Island Common in New Castle, I was hoping to get some intense sunrise clouds and sky towering over the Atlantic Ocean. What greeted me was a cloud filled sky and a peaceful more subdued scene. As the sun rose over the horizon in the distance, it peeked through the clouds in the distance to create this fiery glow behind Whaleback Lighthouse during this 90+ second exposure. Whaleback Lighthouse as seen from Great Island Common in New Castle, New Hampshire. 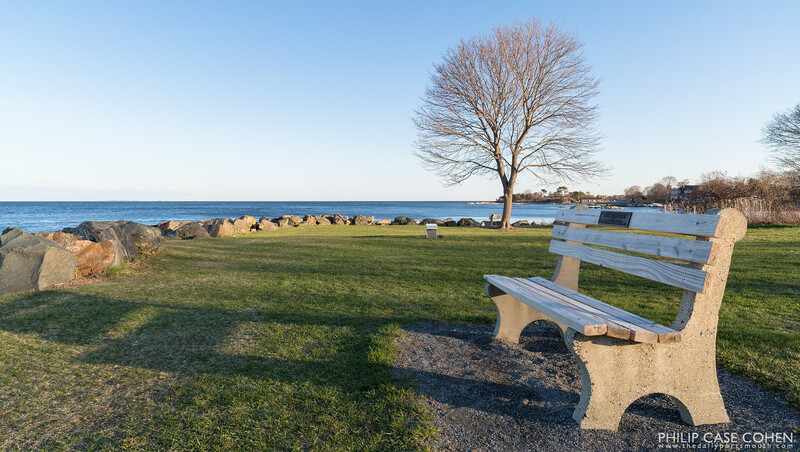 This simple scene at Great Island Common in New Castle, NH is the favorite of many locals and many photographers. 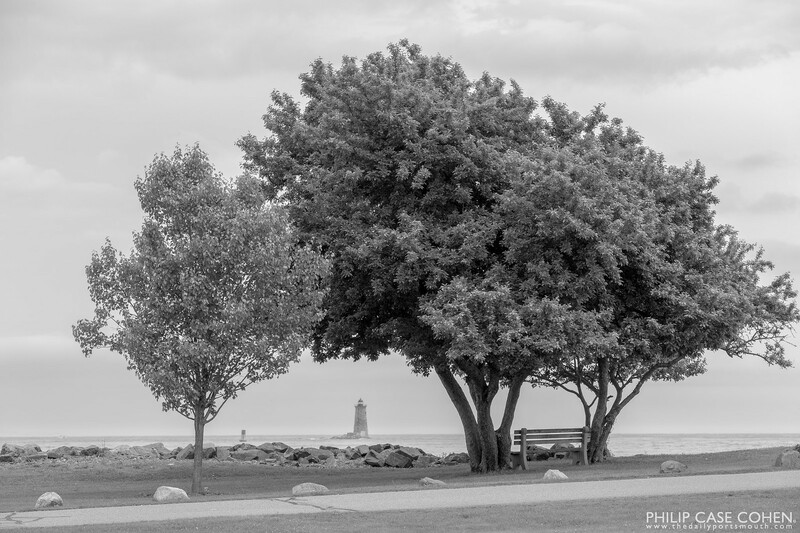 The tree in the distance is one of the most beautiful that I’ve ever seen, and has one of the best views of maybe any tree in the seacoast – perched on the Atlantic Ocean with views of Whaleback Lighthouse, Portsmouth Harbor Lighthouse and the Isles of Shoals.